Class signups will begin March 1. Only those registered for the event will be able to sign up for classes, and your reg fee INCLUDES all classes you can fit into your schedule – register now! 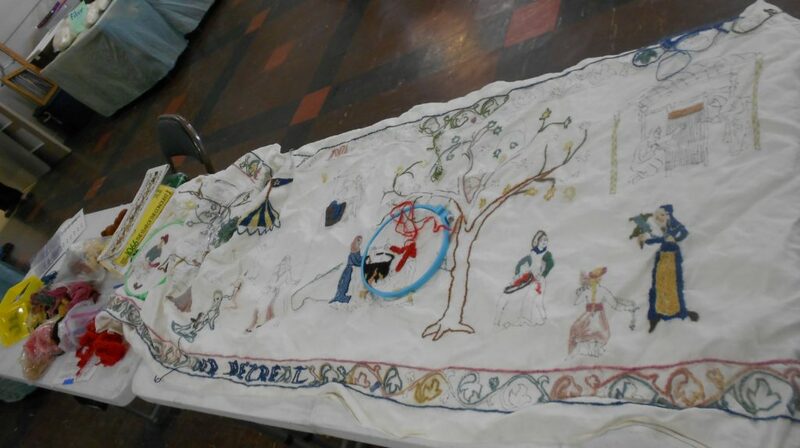 A look at some of the embroideries done ca. 800-1600 C.E. Some live samples and lots of pictures. Also some tips on how to recreate them for yourself. 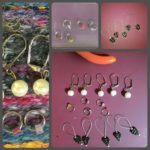 An opportunity to try simple jewelry making while making something of use. No prior experience needed. Tools supplied. Bring: Patience and enthusiasm. 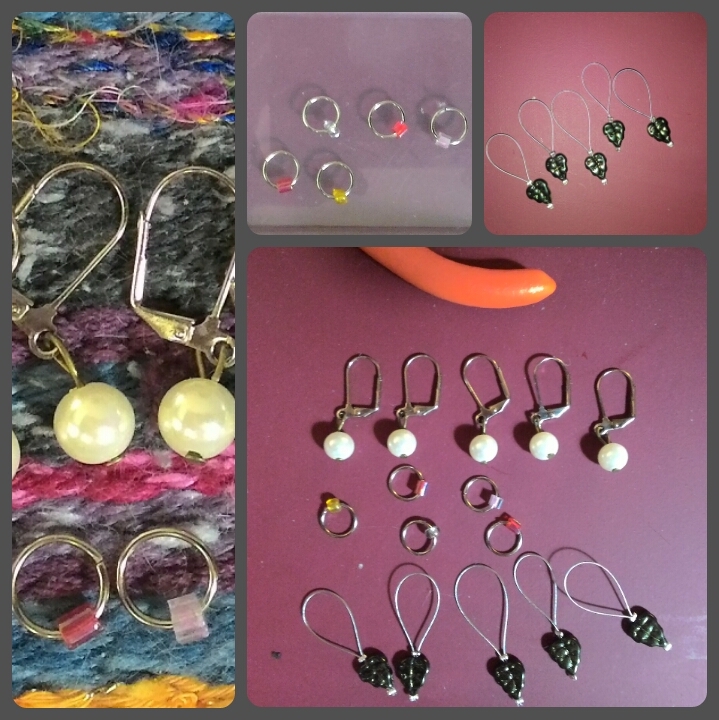 If you have small to medium beads you wish to use feel free to bring them. Pencil and paper if desired. 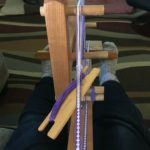 Make that big jump from Inkle to Card/Tablet weaving. Students will learn to “speed warp” their looms, and how to turn, rotate and flip the cards to get hundreds of different designs. Advanced students can use this same warping to learn how to create patterns and write words with string. 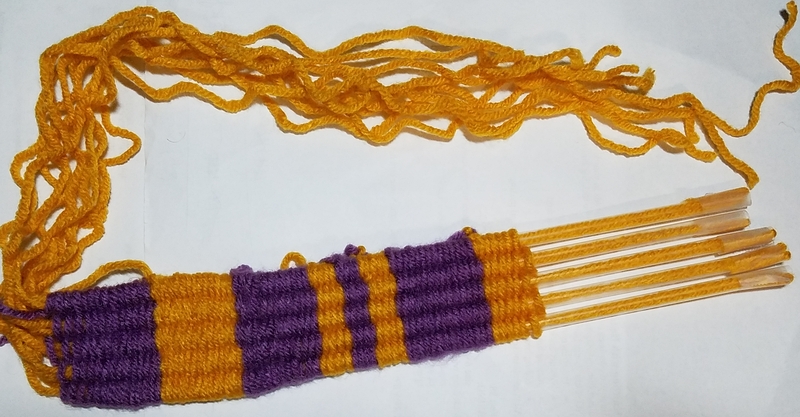 Bring: Card Weaving Loom, 2 balls each of 2 colors of yarn/thread, at least 20 weaving cards. 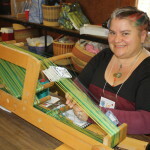 Lacis Weaving Cards can be ordered from Amazon.com or purchased from Unicorn Fiber Arts on site. 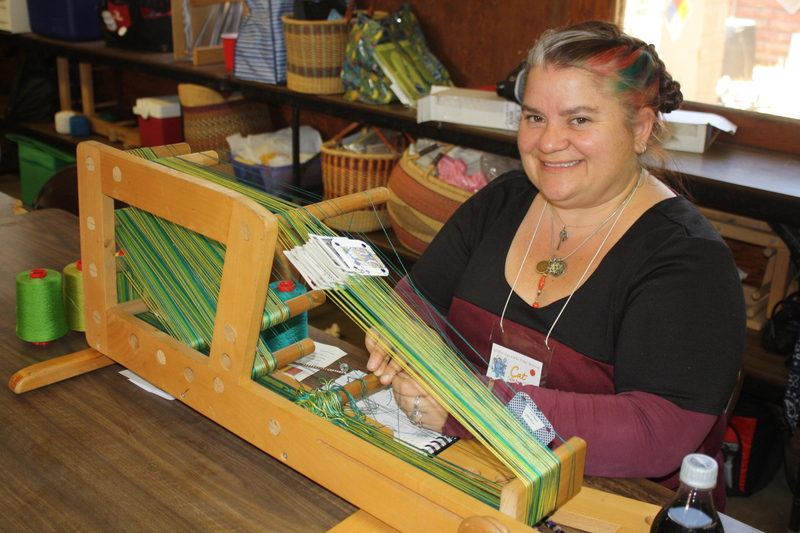 Provided: handouts, heddle yarn, loaner loom (to be used in class by all students without looms), and yarn for sale. Bring: If they have a loom: Inkle loom, shuttle, 2 colors of size 3 or 5 crochet cotton. 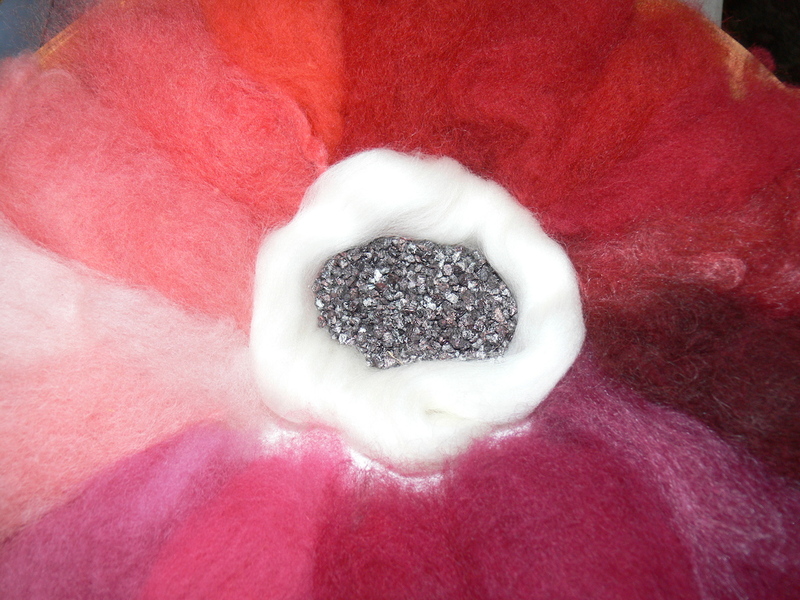 A newly designed cochineal class for our Fiber Frolic! 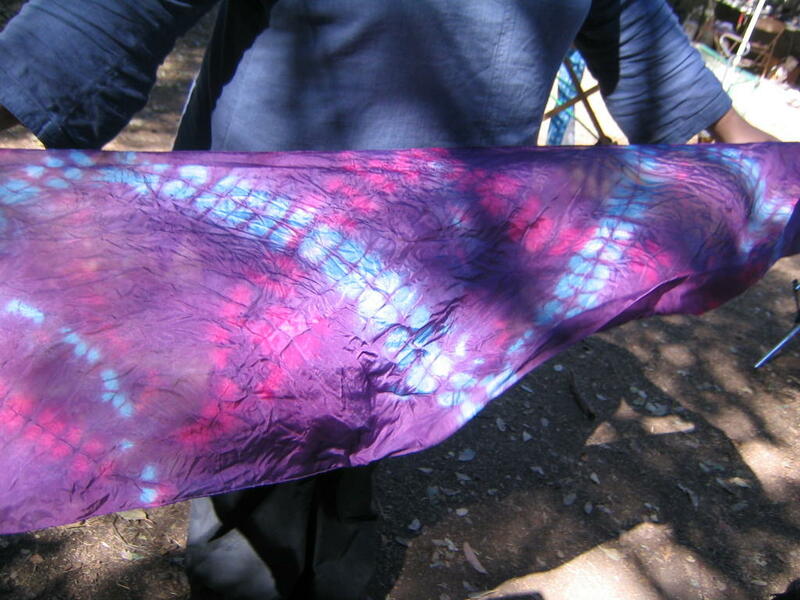 Learn how to use cochineal and move its color from reds, pinks, to purples. Yarn samples of different fiber content & pre-mordants as well as a silk handkerchief will be provided so you can build a cochineal sample set. Beginners to advanced welcome. 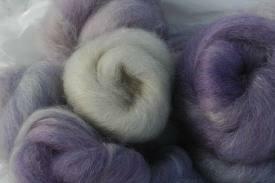 You may bring some small skeins or silk scarves to add to our cochineal dyepots. Dyepots are shared areas. Students should bring: Apron, note taking supplies, small skeins of scoured (washed) if desired, rubber gloves if desired. To help prepare for class students should pre-skein their own yarn that they wish to dye, scour/wash, and pre-mordant if possible. Spindles available on loan or for sale from on site vendors. 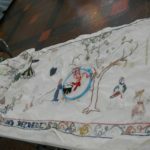 Learn some basic embroidery stitches and contribute to our community tapestry! For best results in dyeing, preparation is key. Bring clean, WASHED items so you’re ready to go. 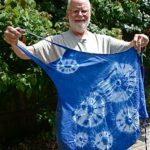 We’ll have some rubber bands and items to try shibori and resist dyeing techniques, feel free to bring your own clamps and whatnot too. 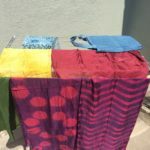 Learn about the right mordants for your fabrics and dyes, and get your items ready to go for the dyepots in the afternoon! Learn how to spin “long draw” on a 150-year old Great Walking Wheel. Or bring your own Great Wheel to learn its special abilities! Spin like they did in olden times! Students will practice one at a time on the Great Wheel. 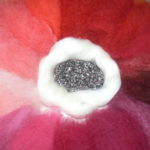 Instructor will have specific time for this class, but can also be available throughout the day for private instruction. Get your indigo on! Pots are for class participants only from 1-3:30, open dyeing from 3:30-4:15. 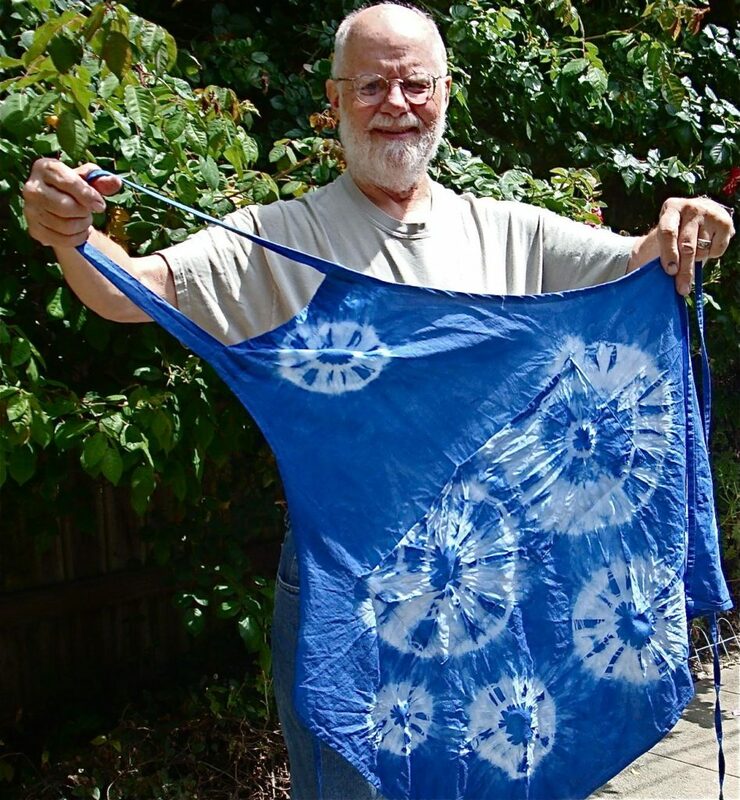 TAKE FIBER PREP/SHIBORI MORNING CLASS FOR BEST RESULTS! Have fun, get blue! 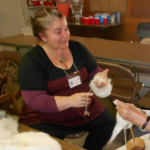 Want to learn to knit? Stuck on a pattern? Want to learn a new technique? 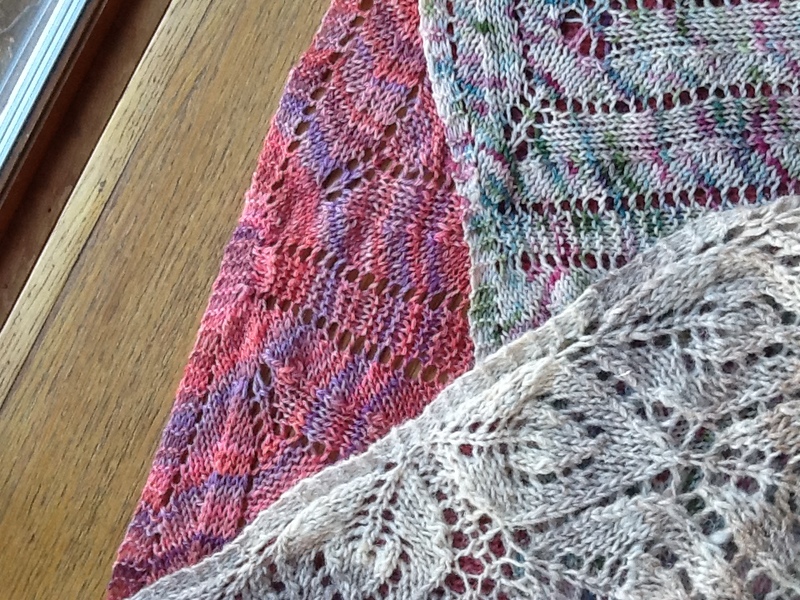 Drop on by the knitting roundtable and get your questions answered! 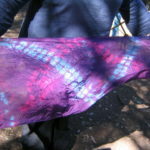 Try natural dyeing! 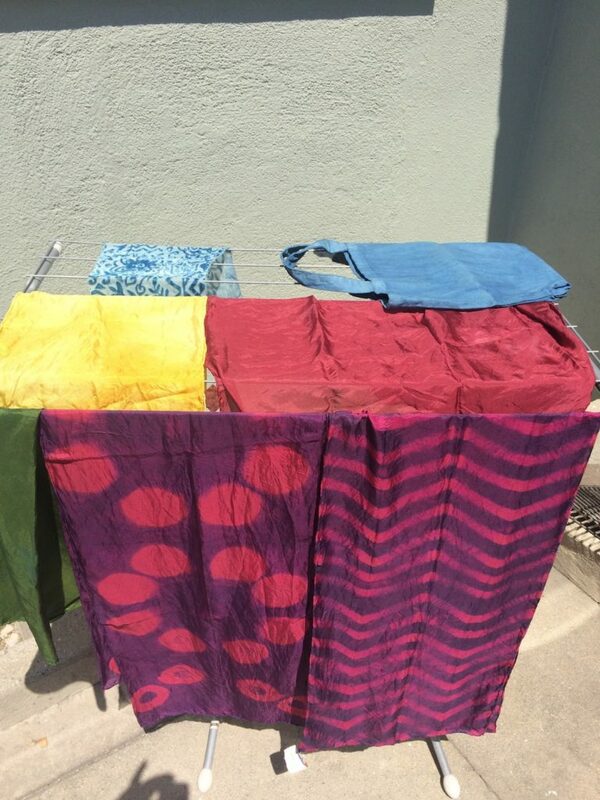 We’ll have red, yellow, and blue dyepots (and maybe some surprises) so you can overdye. 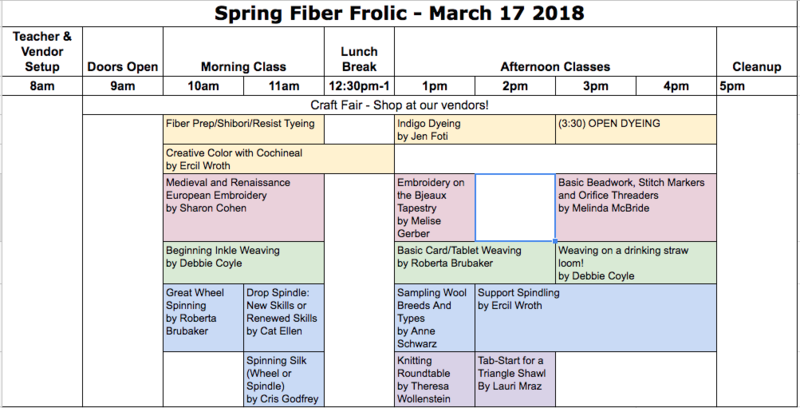 For best results, plan to spend time in the morning at the Fiber Prep/Shibori class so your items have time to absorb the mordant! This is a spinning class for anyone who can do basic spinning (the ability to make a continuous thread.) Spindle spinners and wheel spinners welcome! We are going to make small samples of several different wool breeds, learning about fleece traits and how they affect the finished yarn. 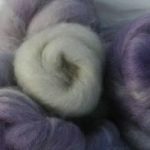 We’ll observe fineness, crimp, staple length, color and luster, and experiment to find spinning methods that work best for a given fleece. We’ll compare samples with each other and learn together, and take notes to start a breed sample notebook. (Notebooks not provided but I will have notes pages that you can put into a binder at home. 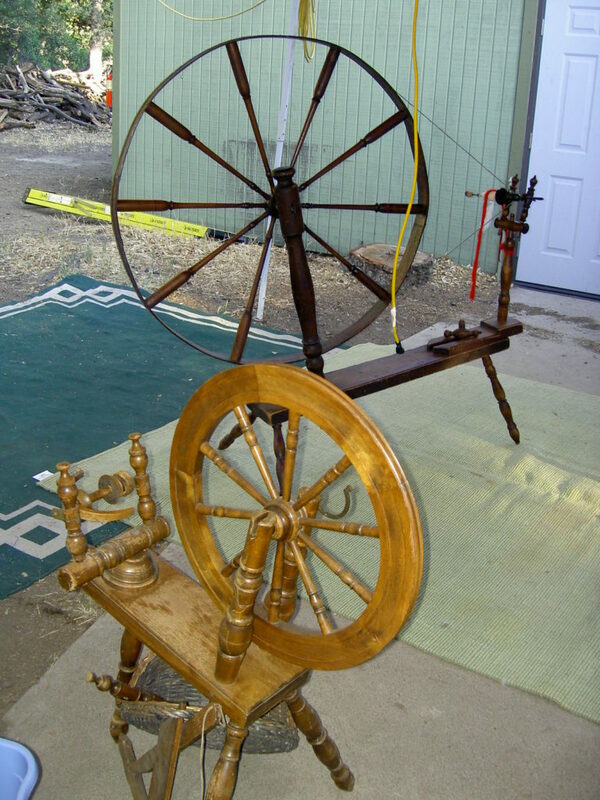 Bring: Something to spin with, a wheel or spindle(s). 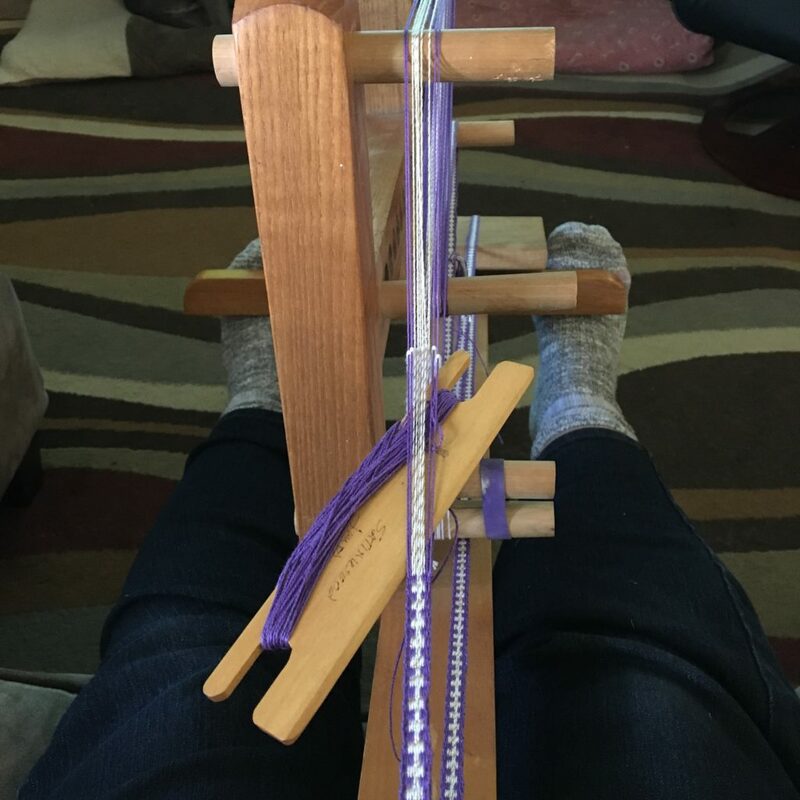 Optional but useful: your preferred tools for winding off and possibly plying yarn samples – for example, a plying tool or nostepinne, small niddy noddy if you like to use them. 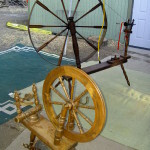 Learn some tips and tricks for spinning silk on drop spindles or wheels – some drop spindles will be available for loan. A review of the types of support spindles used around the world, and the techniques for using them. Practice on traditional spindles and modern ones! Bring one if you have one; some will be available for use during class. 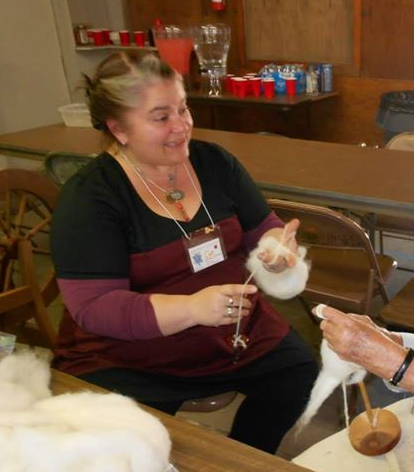 Students in the Support Spindle class should be able to spin a continuous yarn on a spindle. Support spindles will be provided, however students are encouraged to bring their own if they have one. 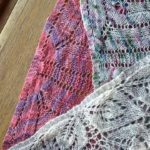 Knitting – Learn a tidy way to begin a double-triangle scarf or shawl with a garter-stitch border. This technique is useful for the simplest or fanciest design! Start a basic scarf, or use my own chevron design. Only the most basic knitting skills are needed, knowledge of purling is a plus. Loaner needles and yarn provided. Bring: You may like to bring yarn for a project (or buy from the vendors!) and appropriate sized needles. Stitch markers may be helpful. Learn to weave on drinking straw loom. 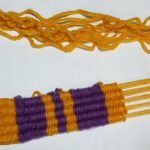 Its a super easy and fun method for weaving bracelets, bookmarks, necklaces, or other narrow bands or tubes! We’ll also discuss how this method works on stick or peg looms. ← Melinda Sherbring is the 2018 Retreat’s Featured Teacher!